There seems to be 2 key players in the smartphone game: Apple and Samsung (what happened to BlackBerry?). Nokia is making roads with it’s Lumia 800 Windows phone. To grab some attention for their new phone, Nokia staged a high-tech show in Millbank, London on the 28th of November 2011. Using 3D projections they dubbed it a 4D show. 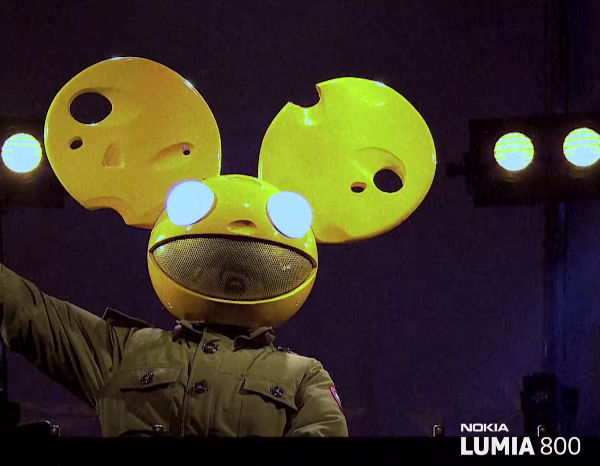 The added dimension comes in the form of sound – having superstar Canadian producer and DJ Deadmau5 perform exclusive remixes. 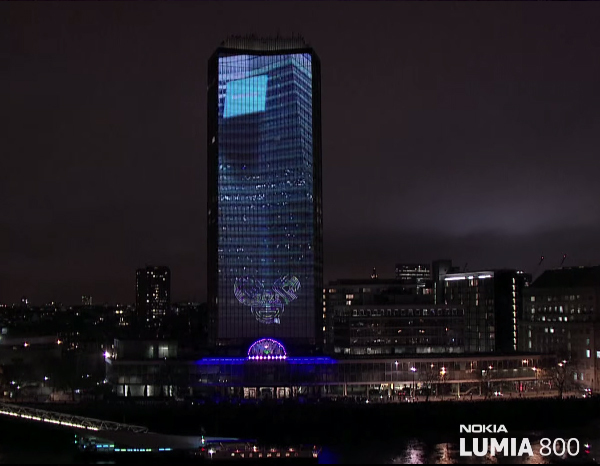 The projection on the Millbank Tower used 16 projectors, and a canvas of 800 windows that were covered in vinyl. 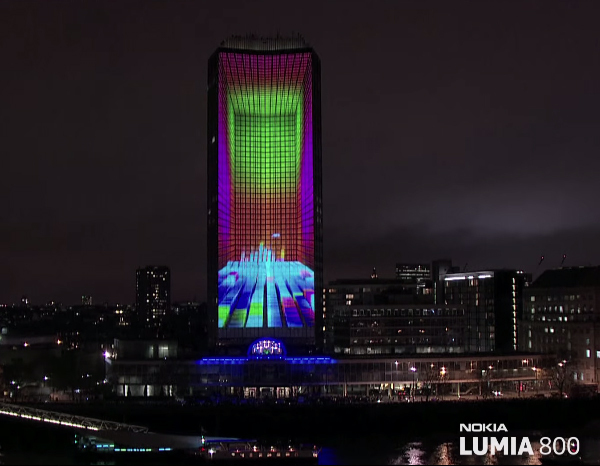 It is probably one of the tallest 3D projections seen to date, however is it really a 3D projection? The graphics were projected onto an almost flat surface. Regardless, it was an amazing event that Nokia pulled off, especially when you take a look at the amount of work it took in their behind the scenes video. When it comes to pure 3D projections, we think Toyota pushed the technology the most when they projected onto an Auris car from all angles with 7 projectors . Projector, Camera, Real Time 3D Mapping: The Internet Umbrella! When deciding to hold a festive event or party outside, there are a number of different outdoor party lighting ideas available to help set the type of mood the occasion calls for. String lights are the best way to go. They can come as the standard electrical kind, or as solar powered making them easy to set up. There are a wide variety of decorative outdoor string lights that can be used to decorate an outdoor party. They come in miniature pumpkins, hearts, flowers and snowflakes to suit different themes. You can even create your own themed DIY party lights by using string lights and origami paper shades (check out the tutorial on how to create your own cheap outdoor party lighting: DIY Lighting: Paper Origami and Outdoor String Lights). Using strings with bulbs that are all the same color will add a magical touch to the outside area. The two most popular colors to use to create a magical outdoor environment are blue and white. White bulbs are often used when celebrating an anniversary or holding an outdoor wedding reception. String lights can be wrapped around railings, posts or tree branches, to create a special effect. A number of them can be hung side by side to create a curtain of lighting, or they can be hung overhead from wall to wall creating a starry night effect. If the party is going to have a garden or tropical theme, there are a number of torches and candles that you can use to create a festive atmosphere. Citronella tiki torches are a simple way of adding outdoor party lights. These are inexpensive and readily available at large department stores or even hardware centers. These tiki torches are just like any other tiki torches, but they are fueled with citronella oil. This oil is bought separately, and will burn with less smoke and act as an organic insect repellent. Getting the right lights for a party can really help set the mood. Depending on the party space you can either go with simple party lighting ideas or go a step further and rent one or two light fixtures. There are also a few outdoor lighting ideas for a party. Here are a range of different ideas: Creating an Enchanting Party Setting With String/Fairy Lights. Outdoor string lights are so freaking versatile. They instantly create a fanciful setting. They can be used in a number of ways. Hang a number of them side by side on a wall to create a curtain of lights. They can be strung across the ceiling to mimic a starry night. They can be lined across counters and on the floor. Have a look here at our photo guide for more ideas on using string lights for cheap party lighting ideas. Using Battery Powered LED Lights to Create Balloon Lighting Here is a unique lighting idea, one that can be store bought or even done DIY. All you need are single LED light bulbs that come with a battery. There is usually a little tab that you pull off to switch the light on. These lights can be turned on and then put inside a balloon. You can have the balloon blown up normally with air and have them lay around on the floor, or they can float in the air if they are blown up with helium. Have a look at our article here on balloon LED lights, for information on ready made balloon lighting and tips on using helium. Decorating Drinks With Ice Cube Lights Want a way to include the drink into the party decorations? Why not add light up ice cubes. These are little LED lights incased within a clear plastic that can be put in the freezer to keep the drinks cool. A great idea would be to tailor the color of the lights to the party: having a Christmas party, then use green and red lights, St. Paddys day – Green, having a ladies night – red and pink. Need some dramatic lighting to fill a large space? Then a few simple rental lights can make a big difference: Uplighting For Parties Uplighting will create a formal and grand setting. These are lights that you put at the base of a wall, columns, etc, and they make a space feel larger – just like in the pictures below. Customizing a Party Venue with Gobo Lighting If you are looking to add a special touch to your party then have a look into gobo lighting. This is when you have a stencil made that fits over a can light. The stencils can be of anything – have star shapes lighting up ceilings, or floral designs lighting a wall, or if you are having an engagement party you can have a monogram of the names of the bride and groom. These stencils will be fitted over can lights, which are common lights that you’ll see on a theater stage or a concert. They can be easily hired at lighting rental companies. Creating a gobo stencil doesn’t have to be a complicated task. It can be done at home with a sheet of tin and a steady hand, or they can be custom ordered from lighting companies. Have a look at our article on creating custom gobo lightingfor instructions on making it yourself or getting them made. Looking to have an outdoor party? Here are a few outdoor party lighting ideas. Using Tiki Torches for a Festive Outdoor Party Tiki torches are a great way of creating a festive atmosphere for an outdoor party. They are easy to pick up at hardware or even large department stores. You’ll want to place the torches 15 feet apart and 3-4 feet away from table or chairs. Citronella oil can be used to fuel the torches, which will produce less smoke and will act as a natural and organic insect repellent. Light Up Pools or Ponds With Floating Solar Lights If you have any water features in your outdoor space, a swimming pool, fountain or a pond, these can be lit up with lights. The lights will wash over the calm water, creating relaxing and enchanting ambient lighting. General floating solar lightscan be used – they can continue to light up the water even after the party. Another option is to use the balloon lights mentioned above as these will float. We hope you have fun decorating your space with these party lighting ideas. Let us know if you have any unique ideas that we can add to the list. 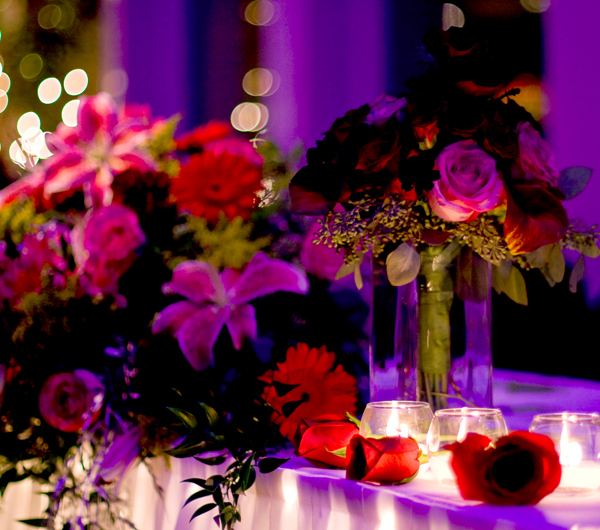 When it comes to wedding centerpieces, candles are the go to choice. 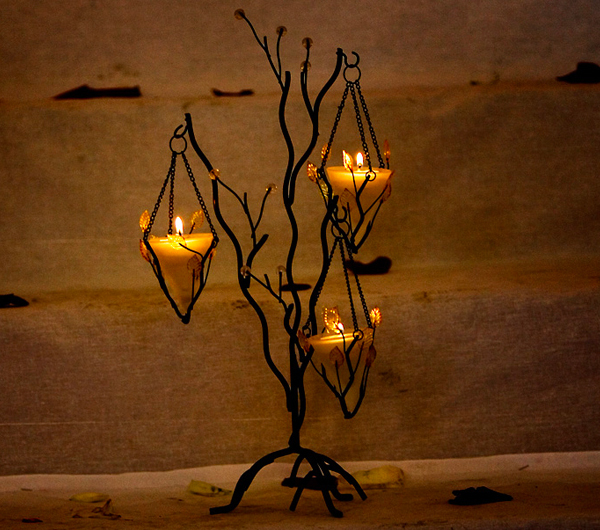 With their soft glow and flickering light, they create a poetic and romantic setting. 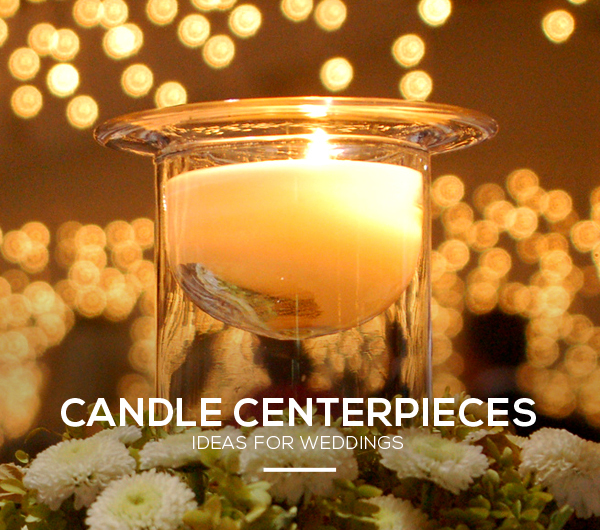 Below we’ll go over the range of ideas for wedding candle centerpieces – from floating arrangements to flameless. Color Coordinating Candle Centerpieces For a Wedding Reception: You can tailor the color of the candle centerpieces to the theme of the wedding, if you have one planned. For example if you are planning on using purple wedding lighting around the venue, then purple candles will tie the table decor in with the surrounding theme. White is usually the go to candle color for traditional wedding styles. Don’t forget, along with color choices, there are also scented and soy based candles to choose from. A wooden, stone or glass bowl or vase can be filled with water and have candles floating in them. 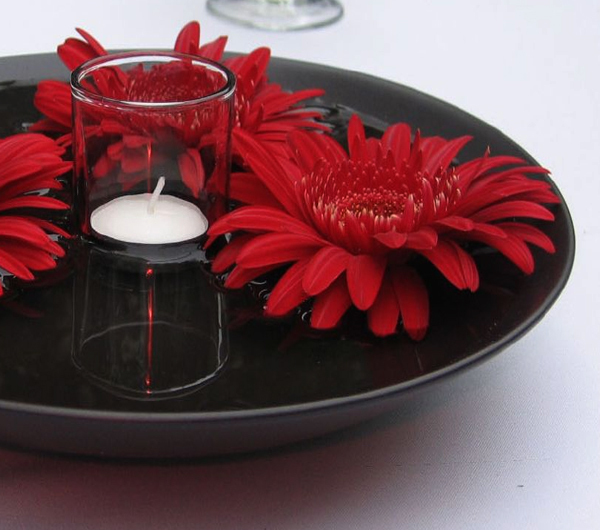 Flowers can also be added to float around the candle and/or decorative rocks can fill the base. Food coloring can dye the water to a certain color creating more decorative wedding reception candle centerpieces. It is relatively simple and inexpensive to have custom made candles created. An elegant idea would be to have candles engraved with a monogram – the first letters of the bride and groom. This can tie into any wedding monogram lighting that you might have planned. There is also the alternative of just having the candle holders personalized – the monogram can be printed onto glass candle holders or engraved onto wooden ones. Lanterns are ideal for outdoor wedding lighting ideas as they will protect the candles from the wind. There are a number of styles to choose from – from the classical Victorian, wrought iron lanterns, to more exotic and decorative Moroccan lanterns. If you are having the wedding outdoors, tiki torches or fire bowls can be fueled with citronella oil, which will work as a natural and organic insect repellent. 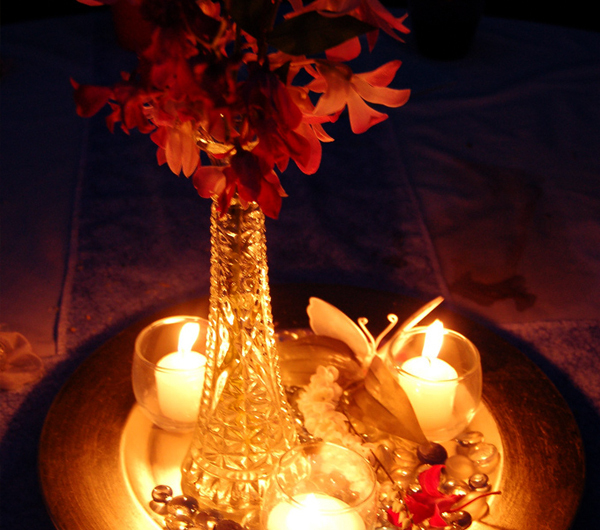 Our article on beach wedding centerpieces includes a number of wedding candle centerpiece ideas. Such as using items found on the beach to create the centerpieces – driftwood logs can be crafted into candle holders, or pebbles and shells on the beach can be scattered on the table around the candles. With the blue sky, waves and the sandy beach as the backdrop, what could be more romantic than having a wedding on a beach? Table centerpieces play an important role in the overall decor and setting the right ambiance for the guests. When it comes to beach wedding centerpieces, there are a lot of ideas to choose from. They range from ready made, to creating your own simple and personalized centerpieces with items found on the beach itself, or using LED lights to create a centerpiece. For a beach wedding, flame based centerpieces are highly popular. These 3 ideas are ready made centerpieces that you can easily find from such places like Amazon. Wrought iron table lanterns are a great choice because of their black texture. The black highly contrasts the pastel colors at a beach wedding – making them focal points on a table. Candles you place inside will provide an elegant centerpiece and will also be shielded from winds. A small tabletop fire bowl or urn will create a dynamic centerpiece. These can be fueled with a small tabletop propane tank or oils. Citronella oil will produce little smoke and will act as an organic insect repellent. 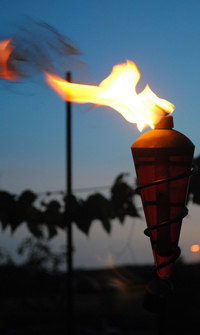 Tabletop tiki torches can also be fueled by citronella oil. A beach wedding is all about being out in nature – with the sea, palm trees, winds, sunsets and starry skies. The best beach wedding centerpieces and decoration pieces in general, will be based on items found on a beach. Items on the beach itself can be crafted into elegant decorations. This makes DIY beach wedding centerpieces a good route to go down. One idea is to craft a unique candle holder out of wood and logs that have washed onto shore. These can even have messages engraved onto them. Or you can wrap the log in fairy lights. Arrangement: The beach candles and decorations can be arranged informally – have pebbles and shells scattered around the table, or you can create a more tidy and formal centerpiece with the use of trays. A wooden tray (black or dark brown trays will contrast well with light colored table cloths) can hold together the decor accessories and wedding candle centerpieces in one place. Also avoid tall centerpieces as they can easily blow over in the wind. The great thing about candles is that you can get ones that float. So there are a lot of diy wedding lighting ideas that can be based around using a glass vase filled with water, candles ,and mixing them with flowers, or decorative rocks and pebbles. More creative additions include coloring the water with food dye, or having a message engraved on wood or metal placed inside the vase. If you want to go for a more tropical and earthy centerpiece then try a wooden bowl filled with water – used with the floating beach candles and flowers. 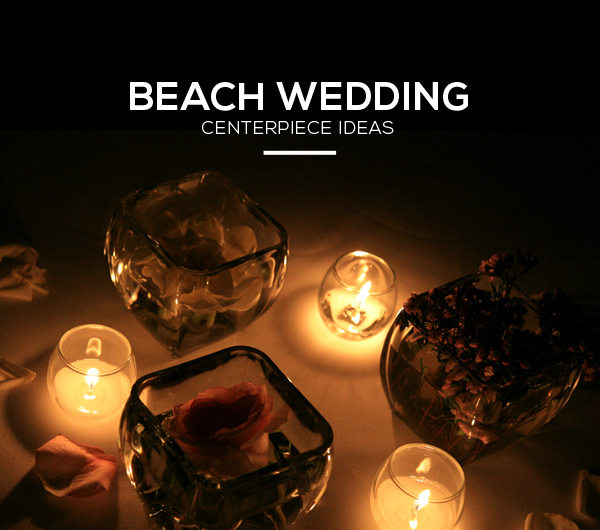 There might be some instances where you would rather use LED wedding lights to create beach centerpieces. They can provide more lighting at tables, and if you are on a windy beach, they won’t blow out. Here are some unique beach wedding centerpieces that use LED lights. You can find LED lights that are battery powered and waterproof, allowing them to be submerged in water. These waterproof LEDs can be used with a glass vase or wooden bowl filled with water and flowers to create a unique centerpiece. 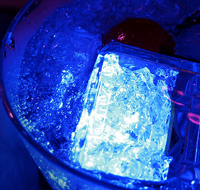 There are decorative alternatives such as using LED light up ice cubes. An alternative to using real candles could be to use battery powered flameless candles. These use a small LED light to mimic the lighting of a candle. Some will even come in a wax base to recreate the candle look as closely as possible. 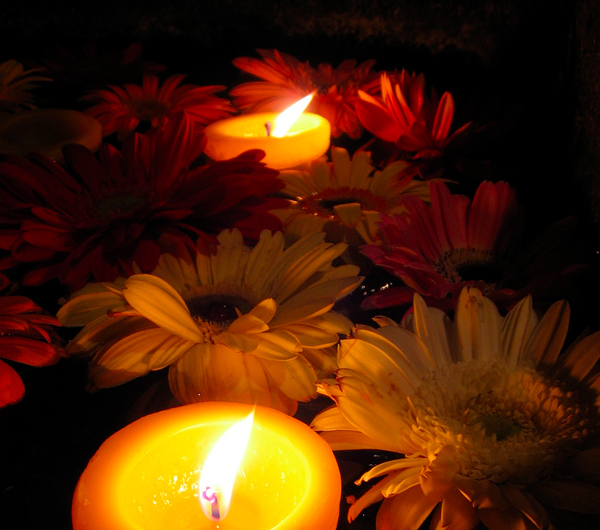 Though not as enchanting as real candles, they can be easily set up, and are reusable. So there you have it, a range of LED and candle beach wedding centerpiece ideas that adds a decorative touch and lighting to a table. Beach weddings are generally small, intimate affairs and lighting can help with setting the right backdrop. 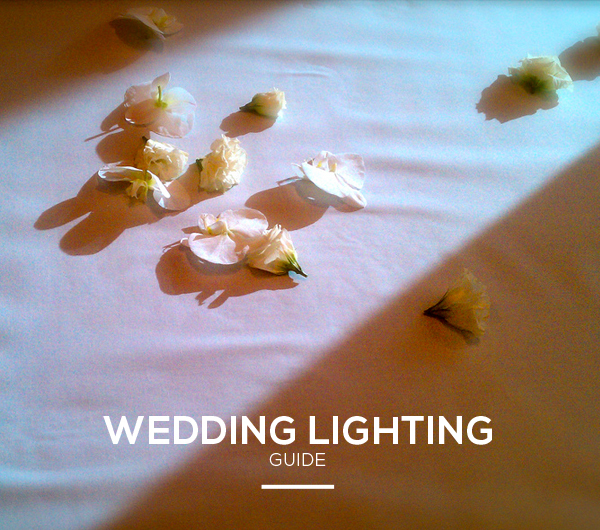 Have a look here for other outdoor wedding lighting ideas.